Few plants rival the extroverted beauty of a climbing vine bursting with purple flowers. There are a number of vines that bear purple blooms ranging in shade from the pale lilac of wisteria to the deep royal purple of morning glories. The addition of a purple flowering vine creates a spectacular focal point to a garden or yard. 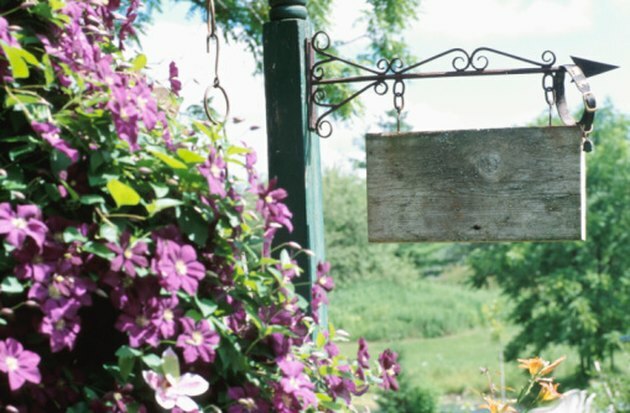 Flowering vines lend a welcoming, homey touch to entryways. 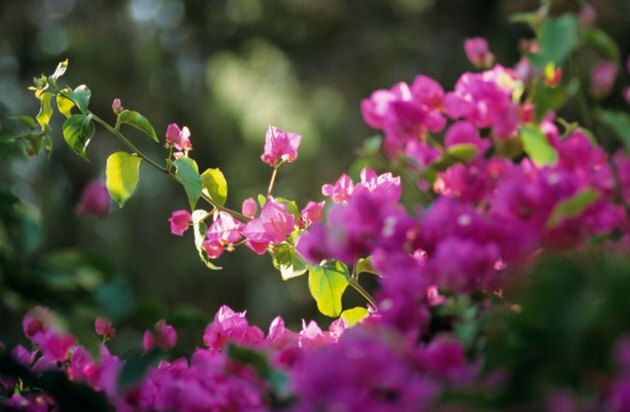 Tropical bougainvillea plants produce masses of brilliant blooms. Bougainvillea vines produce some of the most brilliantly colored flowers in the plant world. This dense, woody vine explodes into huge masses of bracts in vibrant purple, pink, red, gold or orange that persist from spring through fall. Bougainvillea is a tropical plant that grows in the warm climates of USDA hardiness zones 9 to 11, but can be grown as an annual in cooler climates. Bougainvillea plants can spread up to 40 feet in height and 10 feet in width. Some varieties have long, sharp thorns. Wisteria is a delicate shade of lilac. Wisteria is a beautiful enhancement to a white picket fence or pergola. This fragrant, pale purple flower grows in drooping clusters. The foliage is dense and light green in summer and showy yellow in fall. It can spread up to 30 feet tall and 30 feet wide. Some varieties of wisteria are considered invasive, so check local restrictions before planting. Wisteria grows in zones 4 to 9, which includes most of the US from North Florida to Michigan. 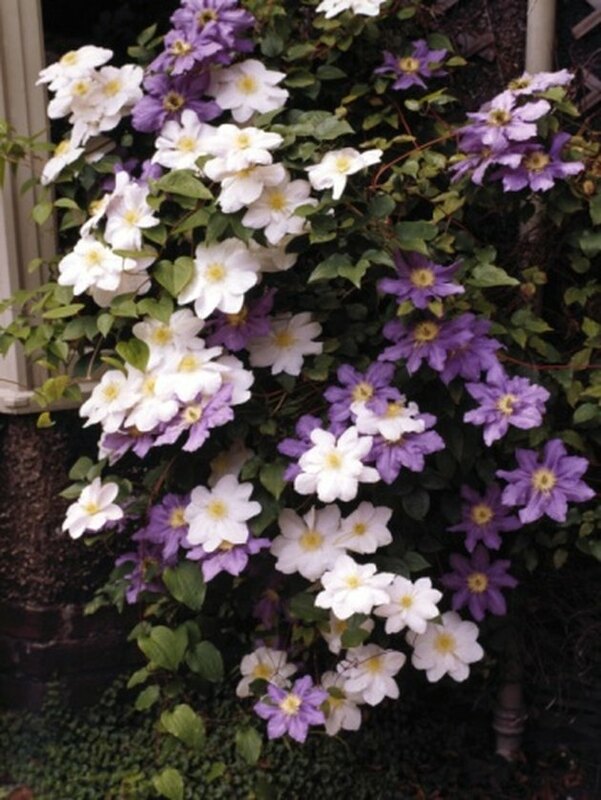 Clematis is a hardy climber, with flowers in a broad range of colors and shapes. One of the most popular varieties is the Jackman clematis. Its profusion of deep violet blossoms make an impressive display during the summer bloom season. Clematis grows in zones 4 to 9 and can spread up to 40 feet in height and width. 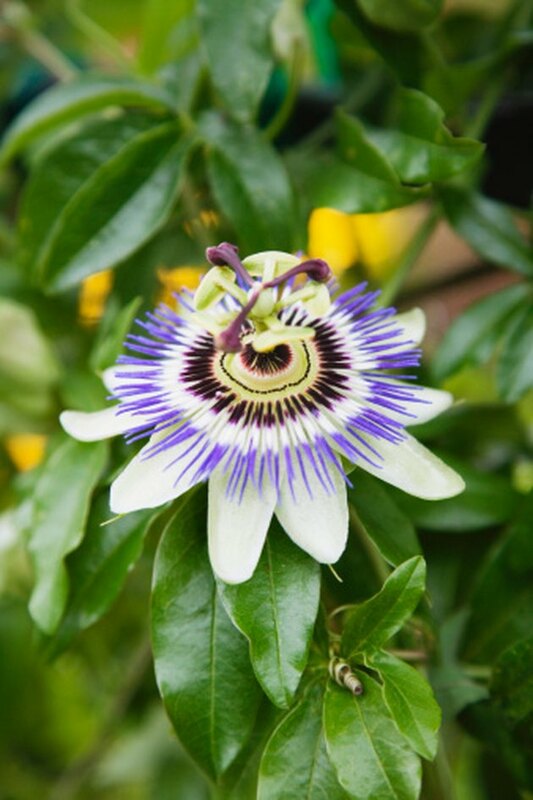 Passion flower adds a touch of tropical excitement to a garden or yard. Passion flower features petals overlaid by a corona of feathery white or lavender segments with dark purple bands. The pale green and yellow reproductive parts in the center of the flower adds exotic flair. Passion flower blooms from May to September and prefers tropical climates. 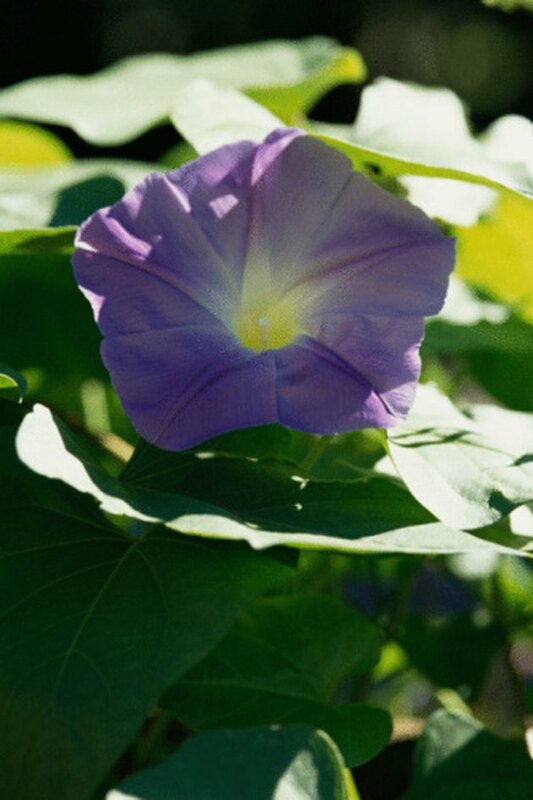 Morning glory are single or double bell-shaped flowers that grow densely on vines. The vibrant color of the purple petals shades to a contrasting sunny yellow or bright pink center. The fast-growing twining vine grows quickly and spreads up to 10 feet. It has a wide distribution across the temperate and subtropic regions of the US.